The Grand Bahia Principe Coba winds through a tropical paradise of lush jungle that leads to a white sandy beach and turquoise water. A family-friendly waterpark, world-class spa, golf course, multiple pools and nightly entertainment are all part of the experience. Couples, families and groups will delight at the vast array of amenities and activities available to them. 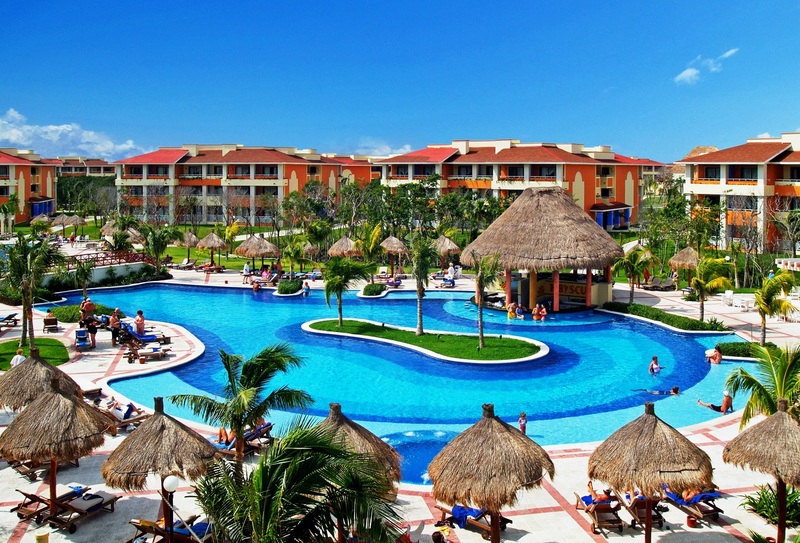 The all-inclusive hotel makes up part of the Bahia Principe Resort Complex which is located 1.5 hours from the Cancun International Airport. Room sizes at Grand Bahia Principe Coba are large enough for the whole family or cozy enough for two. Each room includes satellite television, air conditioning, a hydromassage tub, a mini-bar, iron, safe, hair dryer, coffee machine, sofa and balcony or terrace. Upgrade to the Club Golden section and enjoy 24-hour room service, VIP bathroom amenities, a welcome cocktail and private reception and access to the private club house. Or choose one of the Family Suites and upon arrival find a welcome basket of sweets, a mini-bar stocked with juices, milk and soft drinks, bathrobes and slippers for the whole family, access to the family zone where you’ll find mini-golf, swings and sports equipment, evening babysitting service, a baby station and finally a great location near the Water Park. The Kukulcan buffet is open for breakfast, lunch and dinner and has rotating theme nights to offer a continual variety of options. Or choose one of the a la carte restaurants where your taste buds will be delighted with fresh seafood and avant garde cuisine or opt for more traditional flavors from the Mediterranean, Italy and Japan. The resort does request long pants for gentlemen at the a la carte restaurants. You won’t have to step, or swim, far to find a spot to enjoy a refreshing beverage. The 9 bars at Grand Bahia Principe Coba include 2 swim-up bars, 2 jacuzzi bars, a sports bar, a piano bar and an entertainment bar. A wide selection of cocktails, beer and sodas are available. A visit to the resort is not complete without a trip to the spa to indulge in a signature treatment like a Mayan holistic massage, a passion fruit treatment or a hydrotherapy circuit. For the bride-to-be there are multiple packages and services to make sure you look your best on the special day. Activities are available all day long to keep the kids engaged and entertained. The Principito mini-club offers games and friendly competitions, the Bahia Scouts Waterpark offers endless hours of wet fun or, for an extra charge, hire a babysitter and enjoy an evening out. The Riviera Maya Golf Club, located next to the resort complex, is an 18-hole course designed with both pros and amateurs in mind. Green fees are included for all guests of the hotel. A variety of customizable wedding packages are available to help you realize the destination wedding of your dreams. Whether you need an intimate cocktail reception or a business convention group sizes from 5 to 500 can be accommodated at Grand Bahia Principe Coba.